Glial cells of the cerebral cortex of a child, 1904, ink and pencil on paper by Santiago Ramón y Cajal. Courtesy of Instituto Cajal (CSIC). The Beautiful Brain: The Drawings of Santiago Ramón y Cajal, which were exhibited at the MIT Museum in 2018. A cut nerve outside the spinal cord, 1913, ink and pencil on paper by Santiago Ramón y Cajal. Courtesy of Instituto Cajal (CSIC). The curse of modern brain science is that its founding father, Santiago Ramón y Cajal, was an incurable artist. The Spanish neuroscientist felt that to see an object properly—say, a Purkinje neuron, with its branches as luxurious as a sea fan’s—he needed to draw it. 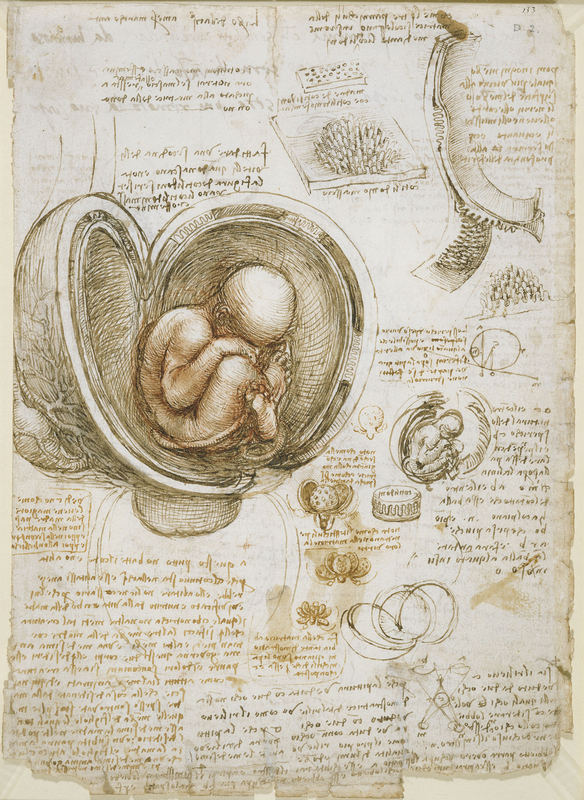 But while his freehand pencil-and-ink sketches have mesmerized students of the brain for decades, they were not exact depictions of the cells he had so painstakingly stained and fixed under his microscope. They were interpretations; they were arguments. Cajal drew not just to see but to explain. Today, more than 80 years after Cajal’s death, neuroscientists have traded their pencils for electron microscopes and MRI machines. These new tools also produce mesmerizing, multi-colored, often computer-animated images—pictures that have fueled countless scientific papers and popular accounts of progress in brain science. But they represent a looming trap. Cajal’s task was to work out the basic microanatomy of the nervous system. He was the first to show that the brain contains billions of discrete cells, rather than an undifferentiated web of neural tissue. Today’s neuroscientists are ready to probe deeper kinds of questions. Ultimately, they’d like to explain how perception, thought, and memory work. They want to know how “the flower garden of the gray matter” becomes a habitat for “the mysterious butterflies of the soul,” as Cajal framed the question in his autobiography. Ultimately, though, those are questions about function and integration, not just structure, and the explanations will not be found in images alone. To visit The Beautiful Brain—a traveling exhibition of 80 of Cajal’s original drawings that landed in the fall of 2018 at the MIT Museum in Cambridge, Massachusetts—is to understand immediately why neuroscience, from its earliest moments, fell under the spell of visualization. Cajal’s drawings are diminutive, often no more than a few inches on a side (the museum supplies visitors with magnifying glasses). But they are alive with texture, depth, and whimsy. The viewer relates to Cajal’s delicate renderings of pyramidal neurons, astrocytes, and blood cells as if they were characters in a graphic novel about cellular survival. To find another investigator who combined Cajal’s technical ingenuity, deftness with a pen, acuteness of perception, and perseverance, you’d have to go back to Leonardo da Vinci, the first person to systematically document human anatomy. Therein lies the burden of Cajal’s legacy. The precision of Cajal’s drawings gives them immense narrative power. With Cajal’s drawings as inspiration, generations of neuroscientists seeking to understand the brain have turned to new visualization tools, such as functional magnetic resonance imaging (fMRI), that seem equally precise. 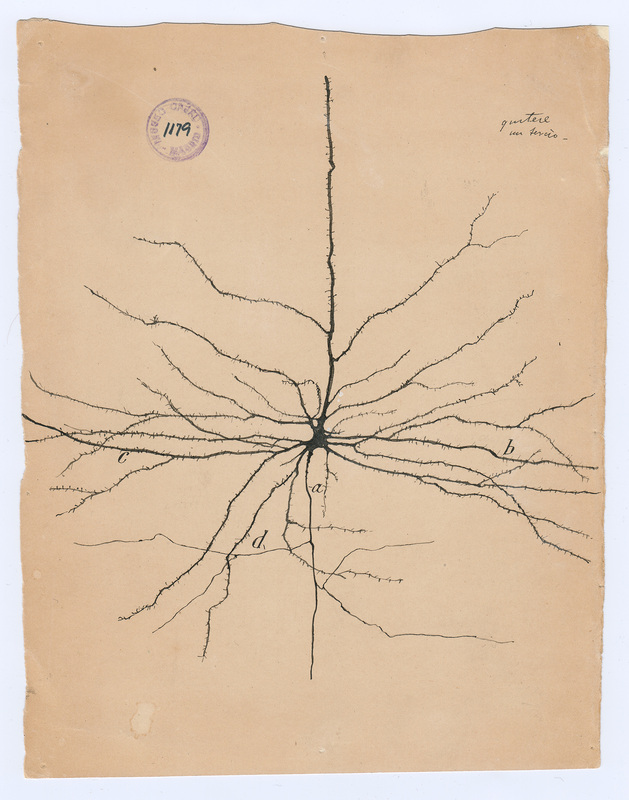 The pyramidal neuron of the cerebral cortex, 1904, ink and pencil on paper by Santiago Ramón y Cajal. Courtesy of Instituto Cajal (CSIC). But there are at least two persistent pitfalls to this approach, neither of which was yet apparent in Cajal’s day. The first is that visualization is always an act of imagination. Cajal had to capture his tiny subjects by hand because late-19th-century microphotography was not up to the task. But he did not always work from life, the way a painter composing a portrait might. No matter how accurate Cajal’s recall may have been, we know today that our memories are reconstructed and altered each time we bring them to mind. And Cajal’s editing went much further than this. For emphasis, he represented some cells—such as astrocytes, the gaudy, star-shaped support cells for which he had an understandable fondness—as much larger in relation to other cells than they actually are. He combined views from different slices of brain tissue. He presented time-lapse “animations,” such as one of a white blood cell squeezing through a gap in a capillary wall. Many of his drawings “were wholly original compositions, mental reconstructions of a complex reality … [that show] many of the same aesthetic decisions an idealized portrait does,” King and Himmel observe. It’s no insult to Cajal to point out that his drawings were, in part, fabrications. They were intended for reproduction in his scientific books and journal articles, and were meant to instruct and influence his readers, not just to document what he saw. Indeed, real brain tissue is such a mushy tangle of neurons, glial cells, and nerve fibers that it’s nearly impossible to represent it intelligibly without the kinds of simplifications Cajal introduced. So representations are always tailored to explain and persuade. But today, the volume of data that must be harvested, curated, and compressed to create a single electron micrograph or fMRI image is vastly greater—and for neuroscientists, the opportunities for exaggeration and self-deception have also multiplied. As fMRI approaches its 30th birthday, this has become a familiar line of criticism—one that was ably summarized and updated by University of Pennsylvania neurologist Geoffrey Aguirre in the 2014 Hastings Center special report “Interpreting Neuroimages.” Aguirre points out that the data for each voxel (3-D pixel) in an fMRI image undergoes multiple processing steps, including image stabilization; statistical comparisons to distinguish real brain signals from random fluctuations; “cleaning” to throw out data below a certain threshold; smoothing to correct for differences between test subjects; and, finally, color-coded display against 2-D or 3-D anatomical images of the brain. The second problem that has beset neuroscience since Cajal’s day is that neuroimaging studies too often proceed as if characterizing a structure or localizing an effect were the same as explaining it. It’s no insult to Cajal to point out that his drawings were, in part, fabrications. Cajal was studying dead tissue fixed in histological slides. Even so, his sheer powers of observation helped him answer a pressing functional question: how does information flow through individual neurons? By examining cells from the retina and the olfactory bulb—places where the brain interfaces directly with the outside world—Cajal was able to intuit (correctly) that electrical impulses, also called “action potentials,” must flow from a neuron’s dendrites to its central cell body to its axon. Alas, it’s not as obvious how patterns of activity across thousands or millions of neurons correlate with mental states or processes. Functional MRI measures blood oxygenation levels in specific areas of the brain over time. This is thought to be an indicator of glucose metabolism, or how hard neurons are working. Images from fMRI studies can pin down changes in blood oxygenation with fairly high resolution—a typical voxel represents a 3x3x3 mm3 cube of brain tissue—which makes it possible to map cognitive processes to specific regions. Work by MIT neuroscientist Nancy Kanwisher, for example, has shown that much of the processing behind facial recognition occurs in a thimble-sized region now called the fusiform face area, in the fusiform gyrus of the inferior temporal cortex. Unfortunately, many neuroscience studies stop at localization. This is unsatisfying, to say the least, since the ability to assign an operation to a specific part of the brain tells us almost nothing about how the operation actually works. The most we can really conclude from fMRI images is that there are consistent patterns of brain activation when subjects are doing things like looking at faces or listening to speech. By integrating many of these patterns, our brains somehow give rise to conscious awareness. But given the amount of apparent redundancy and parallelism in neural networks, it will take a long time to figure out how this all works. But it’s a welcome development that many of the newest techniques for understanding the brain’s functions were not born as imaging tools. Take optogenetics. Using tricks from gene therapy, neuroscientists can introduce light-activated or light-emitting ion channel proteins into the cell walls of specific neurons in live animals such as mice. Some of these proteins work as actuators, causing neurons to fire electrically in response to millisecond-scale flashes of light. Others are sensors that fluoresce when individual neurons fire, providing a readout of neuron-level activity. Though largely untested in humans, the technique is already helping neuroscientists determine which neurons figure in motor control, pain, fear, and various behaviors in animals. Cajal had it easy: neurons are strictly modular. The brain is not. 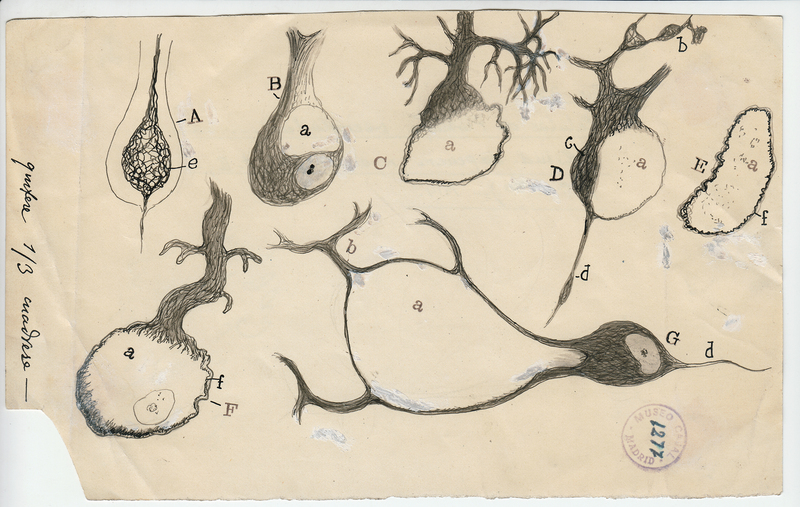 Injured Purkinje neurons, 1914, ink and pencil on paper by Santiago Ramón y Cajal. Courtesy of Instituto Cajal (CSIC). Even more promising as a near-term therapeutic option: multielectrode arrays. It’s long been possible to insert glass-coated microelectrodes directly into the cortex, where they can induce or record action potentials in specific cells. More recently, researchers have borrowed techniques from semiconductor and polymer manufacturing to build implantable arrays of smaller electrodes. A 4mm-by-4mm array might have 100 microelectrodes, each ending in a contact point just a few microns across. Already, microelectrode arrays implanted in the motor cortex are helping people with various kinds of paralysis type several words per minute through a mental point-and-click operation. Similar arrays are being used, both in vitro and in vivo, to study neural development, neuroplasticity, and the interactions of local networks of neurons—the building blocks of consciousness. And that’s to say nothing of the welter of ongoing genome-wide association studies that could reveal genetic biomarkers for psychiatric disorders and neurodegenerative diseases, or of new molecular techniques that allow researchers to study gene expression patterns in the RNA of individual neurons at different stages in brain development. The point is that techniques for monitoring, manipulating, and profiling individual neurons can help researchers infer function from function, not just from structure. They thus have the potential to move our understanding of mental phenomena beyond the cul-de-sacs carved out by large-scale neuroimaging. Cajal had it easy: neurons are strictly modular. The brain is not. To understand it, neuroscientists know they must go beyond their reliance on pretty pictures. It will take a finer net to capture the butterflies of the soul.